MR. HEALY: At the commencement of these sittings last week, I mentioned that further evidence will be given concerning the relationship between the Central Bank and Guinness & Mahon. You will recall, Sir, that the Tribunal last touched on this relationship in or around March of 2000. At that time, in the course of evidence given by a number of witnesses from the Central Bank, and from Guinness & Mahon and elsewhere, a considerable amount of time was devoted to describing what I’ll call the wider Ansbacher operation. In the context of the relationship between the Central Bank and Guinness & Mahon, the defining characteristics of that wider Ansbacher operation were what have come to be known as the back-to-back loans operation on the one hand, and the bureau system on the other. The expression “back-to-back loans” was used to describe an arrangement whereby loans were granted by Guinness & Mahon where those loans were secured by Ansbacher deposits. The true nature of that security however was obscured by the use of coded language, and you will recall that the codes used to describe that type of security extended from the most familiar or most ubiquitous “suitably secured” to cases where the word “unsecured” was even used to describe the existence of a security consisting of an Ansbacher deposit. The “bureau system” is an expression used to describe what was originally a manual record, which later became a computerised record, of Ansbacher dealings involving the recording of Ansbacher transactions across individual accounts. This bureau system was operated within Guinness & Mahon by Guinness & Mahon staff on computer disks which were kept separately from the disks recording Guinness & Mahon’s own customers’ transactions on their own accounts in Guinness & Mahon. The bureau system was actively concealed from regulators, both external and internal, for some considerable time. By that I mean it was concealed from the Central Bank, it appears to have been concealed from both an internal auditor in Guinness & Mahon and other agencies such as regular Companies Act auditors carrying out audits of the company from time to time for the purpose of filing annual accounts. Evidence was given in March of this year with a view to establishing the extent to which the Central Bank was aware of or ought to have become aware of any of those features of the Ansbacher system. At the time of that evidence, the Tribunal was under the impression that the bureau system had only come to the notice of outside agencies, in this case meaning Guinness Mahon & Co. in London, by virtue of the findings of an internal audit, a Report published in 1989. In fact, it now appears that as early as October of 1985, and almost certainly from an earlier date, the operation of the system was being discussed by Mr. Desmond Traynor with an executive director of Guinness Mahon & Company in London. The director in question, Mr. Bruce Ursell, had been associated with Guinness Mahon & Company in London since 1974. He was, of course, also a director of Guinness & Mahon Dublin from in or around February of 1983. At the time of the correspondence, which I have just put on the overhead projector, this man was acting as a director of Guinness Mahon & Company London. This is a letter of the 17th October of 1985 from Guinness Mahon & Company London, to the late Mr. Desmond Traynor in Dublin. You will recall, Sir, that in 1986 Mr. Traynor left Guinness & Mahon, although as we now know, his association with the company was not completely severed and indeed he continued to have an office in a Guinness & Mahon building adjoining the bank’s premises and continued to have the use of the services of the bank. Indeed, his secretary continued to be paid by the bank for about a year or so after he ceased to be a director of the company. “Dear Des, Further to our conversation last week, I confirm that we would be very pleased for to you to continue in the role of Chairman of Guinness Mahon Cayman Trust for a period of at least three years from the end of your employment at Guinness & Mahon. “We would be agreeable to you moving into the office previously occupied by Don O’Connor and having a computer terminal wired up to tap into the Cayman Bureau. “We would also be agreeable to you taking your secretary with you and bearing the cost of this. “It is understood that with regard to these last two items that it is likely that you will have an alternative office location within a period of 12 months and at that time it is very likely that the cost of both the secretary and the office will drop away. “We will pay you a salary of £12,500 p.a. for this. In addition, I understand you will receive a similar sum in Grand Cayman. We will also pay the cost of your telephone. What the letter appears to indicate is that Guinness Mahon & Company London were well aware of the operation of what they describe, in fact, as the Cayman bureau, that is to say the bureau system operating within Guinness & Mahon, or the bank within the bank as it has been sometimes called in evidence, and from the letter, as I suggested a moment ago, it would seem that the existence and the operation of the activities of the Cayman bureau was known in 1985 and indeed perhaps for some considerable time prior to that date. CHAIRMAN: Am I right, Mr. Healy, in surmising that this letter has become available as part of further documentation furnished to the Tribunal by the solicitors to Guinness & Mahon? MR. HEALY: It’s as a result of a continuing obligation on the part of Guinness & Mahon to provide the Tribunal with any documentation that came to its notice which might come within the ambit of an earlier undertaking or an order that this document came to the notice of the Tribunal. Now, it will be recalled that in the course of evidence already given at the Tribunal’s public sittings, it became clear that in or around 1979, Guinness & Mahon, through the late Mr. Desmond Traynor, gave an undertaking to the Central Bank that back-to-back borrowing of a kind which the Central Bank found objectionable would be wound down by 1982. Now, you will recall, Sir, that there was some considerable controversy concerning the nature of this back-to-back borrowing and in particular whether it constituted, in the view of the Central Bank, tax evasion or tax avoidance. For the moment I propose to use the neutral term “objectionable” to describe the type of borrowing as it is ultimately a matter for you, Sir, whether you regard the borrowing as having given rise to concerns that there was tax evasion as opposed to tax avoidance going on in Guinness & Mahon. From evidence given at the Tribunal it would appear that whereas there were increases in that borrowing between ’79 and ’82, on the face of it the impression is given that by 1982 the borrowing had been wound down. However, in fact, back-to-back borrowing continued to be a significant feature of Guinness & Mahon’s business after that date. In other words, the objectionable feature of Guinness & Mahon’s activities continued to form part of its operation after that time although, again, this was actively concealed from the Central Bank. At the same time, evidence was given by the Central Bank from which it appeared that there may have been no active policing of the undertaking after that date. Whether the Central Bank ought to have relied on the undertaking given by Mr. Traynor and whether the Central Bank ought not to have continued to scrutinize Guinness & Mahon’s back-to-back activities after that date is a matter which will ultimately have to be decided by you, Sir. The additional evidence which is now to be given concerns the extent to which Central Bank inspectors – after 1982 – may have come across Ansbacher issues in the course of inspections. You will recall that this was dealt with to some extent in evidence given by Mr. Adrian Byrne. After Mr. Byrne’s evidence, a questionnaire was sent to all of those Central Bank staff who appeared to have been involved in inspections at Guinness & Mahon and arising from that questionnaire and other information made available to the Tribunal by the Central Bank, a number of statements have been made available to the Tribunal concerning, in particular, the 1988 inspection. One of the officials involved in that inspection was a Mr. Terry Donovan. Mr. Donovan joined the Bank’s supervision department from the Currency centre in Sandyford at or around the time of the 1998 inspection of Guinness & Mahon. MR. HEALY: 1988 inspection of Guinness & Mahon, sorry. The inspection was being led by Mrs. Ann Horan. Mr. Donovan has made a statement to the Tribunal in which he asserts that a number of Ansbacher features arose, or at least came to his attention, in the course of his inspection and that he brought these to the attention of Mrs. Horan and also to the attention of Mr. Adrian Byrne. He has stated that he formed the view that it was possible that full information was not being provided to the Central Bank by Guinness & Mahon. He goes on to say that there were inconsistencies between information provided from different sources within Guinness & Mahon and specifically suggests that aspects of the operation of Guinness & Mahon which may have involved back-to-back loans were not being pursued because of the degree of sensitivity involved; that, in other words, aspects of the continuing operation of the back-to-back arrangements were not being pursued or not being scrutinised by the Central Bank. Mr. Donovan acknowledges that at the time he was a very junior official, at least so far as inspections were concerned. He had never worked in that particular arena before and he acknowledges that he may have attached a greater significance to documents he was examining than would have been attributed to those documents by an experienced examiner, and in particular by an examiner who may have been aware of the Central Bank’s earlier dealings with Guinness & Mahon. There is a marked conflict between Mr. Donovan’s statement and the statement provided to the Tribunal by Mrs. Ann Horan, who has informed the Tribunal that she is disturbed by the tone and indeed as is clear from her statement, she is clearly disturbed by the content of Mr. Donovan’s statement. According to Mrs. Horan, Mr. Donovan suggests that she may have unwittingly ignored his stated concerns regarding the activities of Guinness & Mahon, or possibly that she may have deliberately tried to keep references to ‘Hypothecated Deposits’, that is to say back-to-back borrowing, out of the report due to sensitivities concerning Guinness & Mahon. Mrs. Horan rejects any suggestion either that she was ignoring Mr. Donovan’s stated concerns or that she deliberately kept information out of the Inspection Report. Mr. Donovan has also indicated that he brought his concerns to the attention of other members of the staff at the Central Bank, including Mr. Adrian Byrne and Mr. Brian Halpin. Neither Mr. Byrne nor Mr. Halpin has any recollection of having had any dealings with Mr. Donovan related to any concerns he had regarding back-to-back arrangements in Guinness & Mahon. Mr. Donovan goes on to say that he was so concerned that he may have damaged his relationship with Mrs. Horan and Mr. Byrne, who were to be his new superiors in the banking supervision department, that he contemplated seeking a transfer from that department to another department of the Central Bank and that he sought guidance in relation to this matter from a Mr. Michael Deasy. Mr. Deasy has stated that he has no recollection of any such approach from Mr. Donovan. It has not been possible in the course of the Tribunal’s informal meetings with the individuals involved in the inspection to resolve the differences that I have outlined very briefly between their respective recollections. In the ordinary way, the Tribunal would endeavour to adduce evidence, leaving it to the Tribunal to put whatever interpretation is appropriate on that evidence, hoping to avoid, so far as possible, conflicts between the evidence of a significant degree. That has not been possible in this case and the Tribunal has therefore determined to proceed on the basis that the conflicting evidence will be heard. Ultimately, having heard the evidence and any necessary examination or cross-examination of any of the witnesses, it will be a matter for the Tribunal to make findings as to the facts, and in particular, as to whether there were any sensitivities of the kind described by Mr. Donovan and, if so, whether they were brought to the attention of his superiors and ultimately as to whether, and if so, how these sensitivities were handled by members of the Central Bank staff. 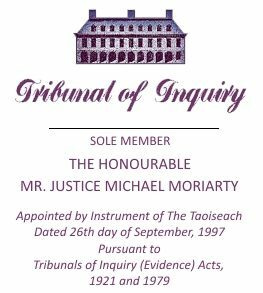 Now, I should say that much of the additional information that has come to the Tribunal in connection with this matter has been mediated through the Central Bank, and I should say that no doubt or query arises as to the completeness of the responses previously given on behalf of the Bank by witnesses connected with the Bank on this or indeed on any other subjects. There can be no doubt as to the level of assistance and cooperation provided by the Bank in general with the Tribunal. This additional information has come to the attention of the Tribunal as a result of the questionnaire I mentioned earlier and again, as I said, much of the information has been mediated through the Bank where it has involved current serving bank officials, although in Mr. Donovan’s case, he is represented by his own solicitors. Mrs. Horan is no longer an official of the Bank and hopes to be represented by her own solicitor, subject to any order you may make, Sir. It is through the Central Bank that the Tribunal made contact with officials no longer employed by or associated with the Bank. The Central Bank itself has stated that, as far as it is concerned, it considers that each inspection of Guinness & Mahon, including the 1988 inspection, was conducted thoroughly and in a proper manner. None of the officials from whom evidence will be taken today and none of the former officials has ever come across anything in the course of an inspection which might have led them to an awareness of the bureau system. There is one other matter concerning a correction to the transcript, but I think there is some further details to be examined concerning that and I’ll deal with that tomorrow, Sir.